A top dress fertiliser that provides nitrogen and calcium nutrition for vegetables, fruits, vines, flowers, turf and ornamentals. The nitrogen in calcium nitrate is fully available to plants and provides an immediate and predictable growth response. The calcium helps to reduce plant disorders such as bitter pit of apples, blossom end rot of tomatoes and capsicums, hollow heart of brassica crops, and assists in reducing tip burn of lettuce. 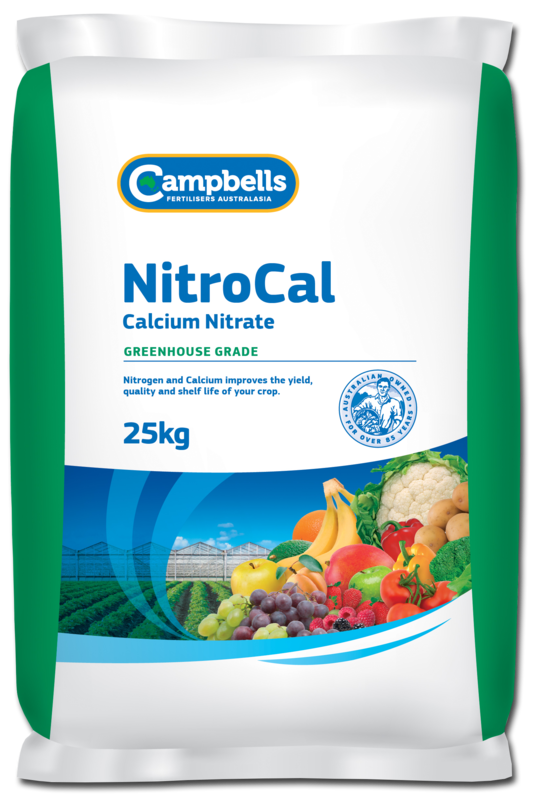 Campbells NitroCal can be the major nitrogen source in a fertiliser program or strategically used at specific times in the development of crops, in conjunction with other fertilisers. NitroCal greenhouse grade can be applied through the fertigation system, as a foliar spray and can also be used in hydroponic systems. NitroCal is particularly suitable as a post harvest application on stone fruit, pome fruit and vines, where it is important to achieve the best flower quality, fruit set and early fruitlet development the following season. General rates for horticultural crops are between 25 to 70 kg/ha through the fertigation system. When applying NitroCal through the irrigation system more frequent and smaller applications guarantee the nutrients are supplied to the plants without being lost due leaching or excessive rainfall. General foliar application rates are at a concentration of 1-2%. The actual rates, number of applications and their timing will vary considerably for different crops and for different districts. Before application, seek advice from your Campbell’s NitroCal Greenhouse Grade distributor or your local agronomist.